Sciatica/Lubar Radiculitis -This is a condition that is characterized by pain, weakness, or sensory changes along the sciatic nerve pathway in the lower extremity. Pain typically radiates down the back of the buttock into the lower extremity. Some people describe the sensory changes as “pins and needles” and the pain is described as “sharp shooting pain”. Herniated/Bulging Disc (most common cause of sciatica) – Separating each individual vertebrae (spine bones) are discs that act as cushions that minimize the impact that the spinal column receives. Since the discs are designed to be pliable and provide support, they have a tendency to herniate backwards through the outer ligaments and causing irritation to adjacent nerves. Disk disease is one of the most common causes of chronic lower back pain and accounts for approximately 10% of all low back pain complaints. Degenerative Lumbar Spinal Stenosis (DLSS) – A disorder due to narrowing of the spinal canal diameter causing nerve impingement. Spinal stenosis can result in persistent pain in the lower back and lower extremities. Those affected often complain of difficulty walking, chronic back and leg pain, decreased sensation in the lower extremities, and decreased physical activity. Many people with spinal stenosis present with bilateral (both left and right) lower extremity pain radiation. Caudal epidural steroid injections involves injecting a steroid into the epidural space, where the irritated nerve roots are located. 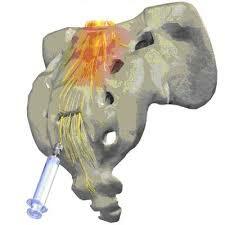 The caudal injection is performed through the sacral opening and is used to treat low back pain. This injection includes both a long-lasting steroid and an anesthetic (Lidocaine, Bupivacaine). The steroid reduces inflammation and irritation, while the anesthetic interrupts the pain-spasm cycle and nociceptor transmission. The medicines spread to the most painful levels of the spine, reducing inflammation and irritation. The entire procedure usually takes less than 15 minutes. The technique can be combined with other medications and a small catheter. If this is performed the technique is call Epidural Lysis of Adhesions, or the Racz Procedure. This was designed to destroy scar tissue in the epidural space. Scar tissue often results from prolonged irritation, inflammation, or previous surgery in the area. Low back pain (LBP) is one of the most difficult conditions for physicians to treat. Commonly LBP goes into remission with periods of decreased or absent symptoms however, the pain often returns and can causes a chronic pain syndrome. Treatment for LBP is specific to the type of injury that is present. There are several options available ranging from surgery to acupuncture to physical therapy. Surgical procedures are typically done when conservative options are exhausted and are not successful in reducing pain. Surgery is also indicated when the LBP is causing new weakness, bowel or bladder incontinence, spinal instability, or infection. Potential causes for these changes include severe lumbar disc herniation, vertebral body fracture or displacement, and progressive spinal stenosis. Degenerative lumbar spinal stenosis (DLSS) is the most common reason adults over the age of sixty-five receive spinal surgery. More recently, a large study has shown that fluoroscopically (x-ray) guided, caudal epidural injections represent a relatively safe option for the management of DLSS generated pain.. Many people do not want to undergo spinal surgery because of the risks associated with it. Caudal epidural steroid injections do have risks, but they are typically low. This pain treatment is considered an appropriate non surgical treatment for many patients who suffer from pain. Complications of the injection can include bleeding, infection, headaches, and nerve damage. The medications used can also cause pharmacological complications. These risks include allergic reaction, high blood sugars, decreased immune response, and the potential for weight gain. Along with proper technique, the procedural risks are reduced by using fluoroscopic guidance (x-ray) to position the needle and watch the medication spread during the procedure. Many of the patients who receive these injections for management of their chronic back pain enjoy improved function and diminished pain for years and can benefit from additional procedures for prolonged relief (Barre 2004). If your pain has lasted longer than four weeks or is severe in nature you should see a pain specialist about the most appropriate treatment options. Early intervention may decrease the chances of developing a worsening chronic pain syndrome.